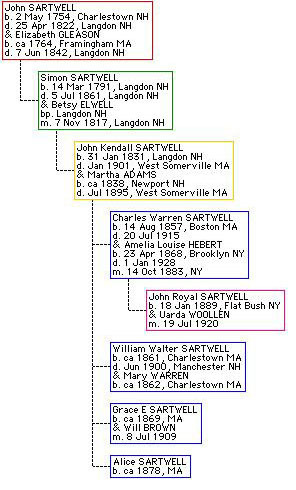 These Sartwells, from John Kendall and his wife Martha Adams who was Fred's aunt, are the ones known to him during his lifetime. What I know of them comes from his diaries and photographs. They lived in Boston MA for the most part. Charles Warren Sartwell and Amelia Louise Hebert moved to Southern California in the early 1900's and Fred saw them when he moved there himself.